I can out run Ryan Hall, Meb, and Dean any day. I am so elite that no runner can touch me! And I do it so effortlessly too, as is evidenced in this photo below. NOBODY within a mile of me. I rock. I'm not lying when I say that nobody was near me. They were actually all ahead of me! In fact, they were far far ahead of me! That's what happens when you have a late start. As unfortunate as it was, I got lost getting to the start line of the Western Pacific Marathon. I took a few wrong turns and ended up in the wrong city. Luckily I was only 15 minutes late and the race director allowed me to start. My running partner in crime, Ultra Woof, decided to take an even later start, so she waited an additional 15 minutes and ran with the half marathoners. Unbeknownst to me, there was quite a fanfare due to her tardiness. As all the half marathoners lined up, a Brazen Racing staff member announced over the loud speaker, "will the person who was late for the marathon please come to the front of the line to take your start." Can you imagine being singled out like that and having everyone stare at you as you make that trek to the front of the line to take your start all alone? I remember a few years ago, I went to see the Blue Man Group in Las Vegas, and about 15 minutes into the show, a deafening alarm went off and the Blue Men stopped the show to embarrass a guest who showed up late. They shined a spot light on the unsuspecting guest and serenaded them with a special aria. "You're late! You're late! You're laaaaaaate!" All this, of course, was broadcasted on the big screen for all to laugh at. I don't believe anyone laughed at Ultra Woof, but I can only imagine the confused snickering which took place. Hey, at least Brazen didn't film and broadcast on the big screen her pushing to the front of the pack while knocking over runners with her trademark refrigerator strapped around her hips. (Yes, my running partner carries a grocery store, liquor store, and pharmacy in the form of an oversized fuel belt.) In any case, Ultra Woof got to start before the half marathoners, and she caught up to me at my mile three. We're looking more like Olympic figure skating pairs than marathoners. Check out this perfectly executed side by side double axels. After having endured the most laborious ultra double of my life last weekend in Lovell Canyon, Nevada, I really needed to take this race nice and easy. My master plan was to milk the clock and finish at a comfortable pace. 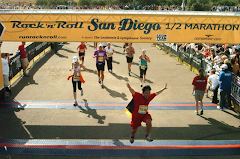 I hadn't fully recovered from Labor of Love and the double marathon the weekend before that, but I had enough gas in the tank to get through my 21st marathon. With a 7.5 hour time limit, I believed that I could get through the race without over exerting myself too much. That late start threw me for a loop, but I quickly deleted that virus from the hard drive of my brain and moved forward. 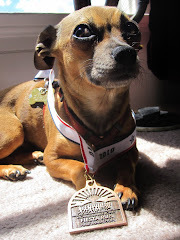 I plugged along the first three miles, and once Ultra Woof arrived, the race got fun. We ran, we gorged our faces with rice crispy treats at the stations, we high fived all the volunteers. 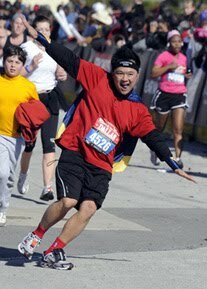 It was funny, even though I was not in endorphin gear, everyone seemed to know that I was the marathon caped crusader. 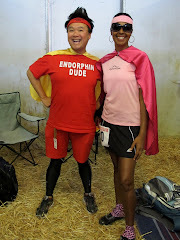 One volunteer even asked, "Hey Endorphin Dude, where's the cape?" 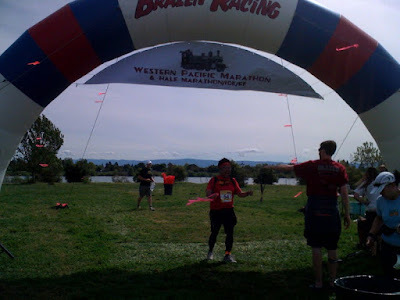 What I also loved about this race was the out and back course. 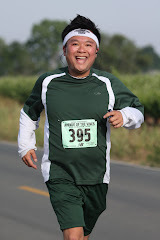 Throughout the 26.2 miles, I got to see familiar faces run by. And there's the fridge around the hips. There are more compartments in the back. I'm telling you, she has a grocery store, a liquor store, and a pharmacy strapped on her hips! Here we are with fellow Marathon Maniac, Valerie Hower. We first met Valerie at the New Year's One Day. Valerie volunteered at the aid station at Western Pacific. Sometimes Ultra Woof gets off balanced because of that fridge on her hips, hence her posture gets slightly off. To the right of her is Alex Munoz, a fellow DSE member. Not really sure what' going on here. Looks like Ultra Woof is taking a bite out of Sharon Munoz's shoulder. I didn't realize that my running partner is part cannibal. I better watch my back or she'll eat it. 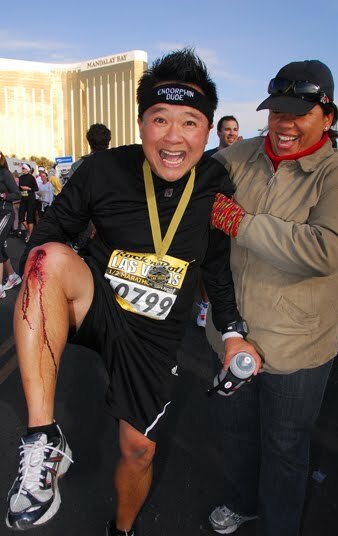 There's fellow Half Fanatic, David Gallegos. 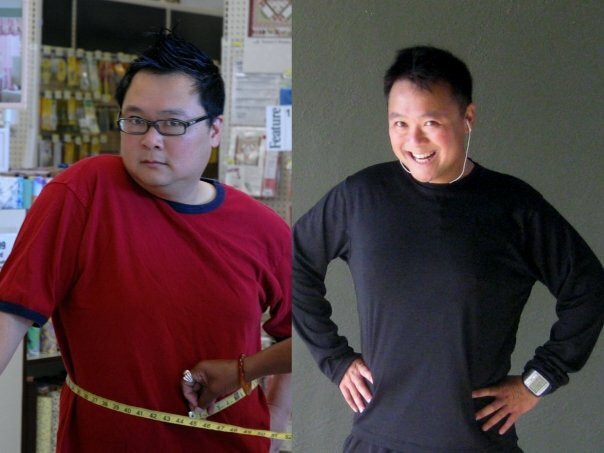 Would you believe me if I told you he used to weigh over 300 pounds? No kidding. Here's one of my favorite runners, Alison Cooksey. The funny thing is that we didn't meet at a running event. We met at a mutual friend's birthday party. Most of my runner friends I meet at a race! And there's the Wogging Tortoise herself, Mae Lee! I'm not going to lie, my body was exhausted. 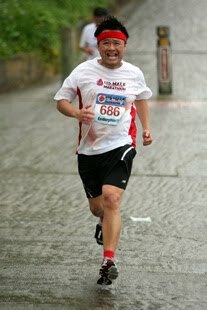 I felt like I shuffled through this race. It took me a long time to get to that finish line. By mile 20, my body was beat. The blisters on the bottom of my foot went through mitosis and before I knew it, there were blisters on top of blisters. 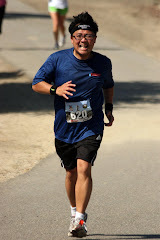 The final 10k was physically uncomfortable for me, but I kept chugging along. 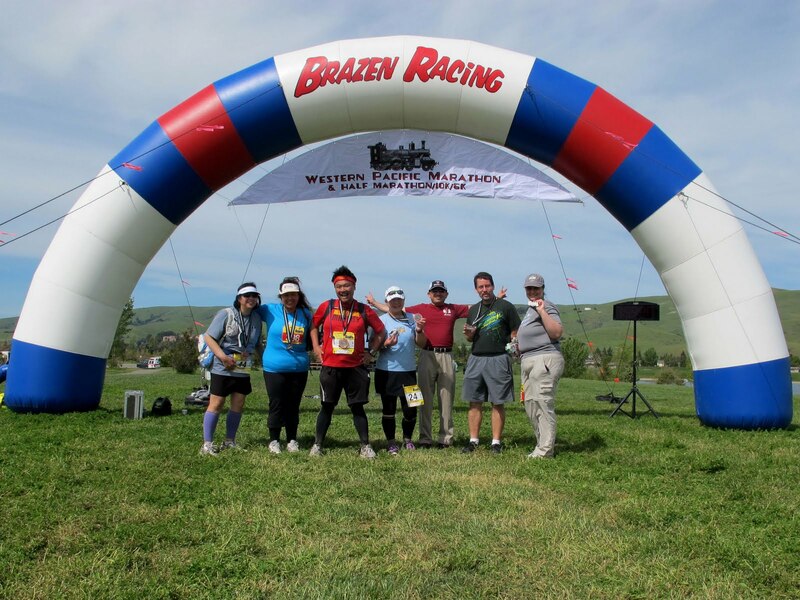 When I finally made it to the finish line, I was greeted by all my friends. 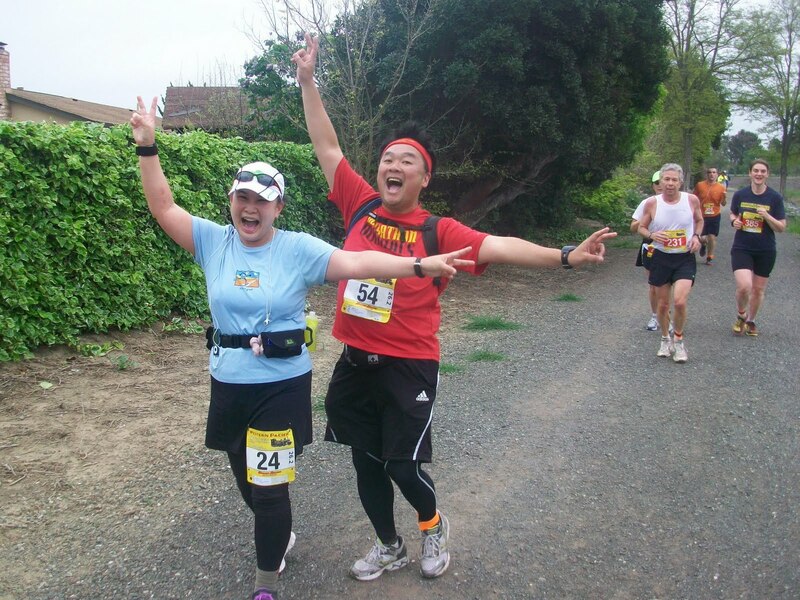 My sister Diane, who ran the half marathon, waited for me even though she had an appointment to get to. I saw this glow in her face, and I had a had a feeling that she was very eager to talk to me. When I asked her how she did, my sister exuberantly gushed, "I PR'ed!!! By 4 minutes!! I so want to be a Half Fanatic now!!" The girl was clearly on runner's high, and I love it, because I am the one responsible for getting her into this running thing! Also feeling the runner's high were Chris Bliss, fellow half fanatic David Gallegos, Wogging Tortoise, and fellow Marathon Maniac Mohan Dutt, who came out to support us even though he didn't run the race. 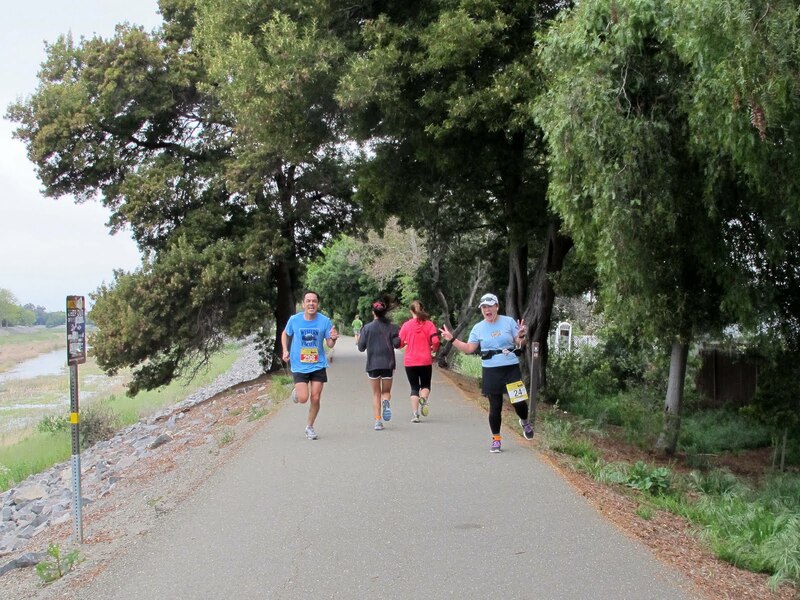 Endorphins ran amok at the finish line and everybody was beyond happy! Oh, what an awesome day! From left to right: Wogging Tortoise, Mademoiselle Escargot, Endorphin Dude, Ultra Woof, Mohan, David, and Chris Bliss. 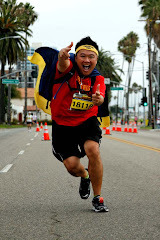 Running marathons is not easy. Pursuing 52 marathons in 52 weeks is even harder. I am doing this because there is something deep inside me that wants it more than anything else. I can't explain it. This is what keeps me pushing when the going gets rough. I will pull out all the stops every time and find creative ways to get to that finish line. I've said it before, and I'll say it again and again: I am not the fastest in the pack, but I always finish, and when I do, I feel like a winner. Titanium Scoreboard: 14 down, 38 to go!